Journey back to Ancient Greece on this half-day shore excursion to Delos Island from Mykonos. 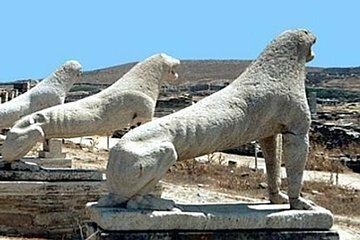 Explore the remarkable ruins of Ancient Delos, learn how the city was the mythological birthplace of Apollo, and admire landmarks such as the Temple of Apollo, the sanctuary of Artemis, and the amphitheater. Poorly organized. Guide was not fluent in English as was promised when booked very difficult to follow. Ended up learning more by following other tour groups. Our tour was self-guided so the tour company's involvement was limited to boat transportation to the island. Unfortunately for us the seas were quite rough and a larger boat would be been a better option. Otherwise the excursion met all our expectations. Great archaeological excursion with a friendly crew. Take this trip, you won't regret it. Had it not been for our pick up contact person, I would have given this tour a 5 rating. She was the rudest person - hard to believe that someone like her was in the tourist industry. I have rarely seen someone who hates their job as she obviously does. I would put her name, but I do not believe she introduced herself ever. Horrible, horrible representative of your company. When she left us at the dock, all was perfect. Our guide on Delos, Eva, was wonderful. She was an archaeologist and her knowledge of her subject was comprehensive. She was also entertaining and fun. She brought history to life. If we had had a different contact person, this would have been a perfect tour.